A power supply is a hardware component that supplies power to an electrical device. A power supply can be given from the battery or from a hardware circuitry which converts the AC supply into the DC supply or step-down AC to step-up AC and vice-versa. A variable power supply is one which facilitates the user to vary and adjust the desired output voltage and output current. Usually, a potentiometer is used for voltage adjustments. The variable power supply circuit is equipped with an adjustable voltage regulator to adjust the output according to the output. An adjustable voltage regulator has line regulation and load regulation. This block diagram shows how the AC voltage is regulated in the circuit. 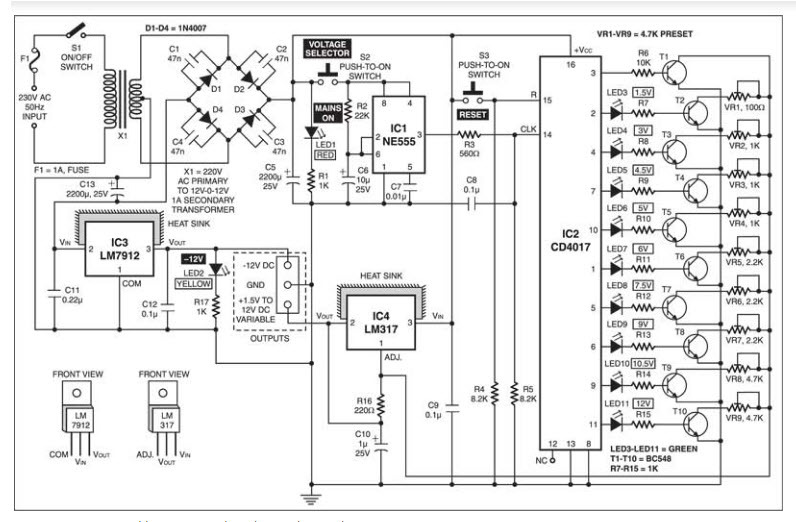 This circuit diagram is given below. The main supply of 220V is fed directly to the centre tapped transformer. This transformer step downs the 220V supply to 24V which is then rectified through a bridge rectifier. 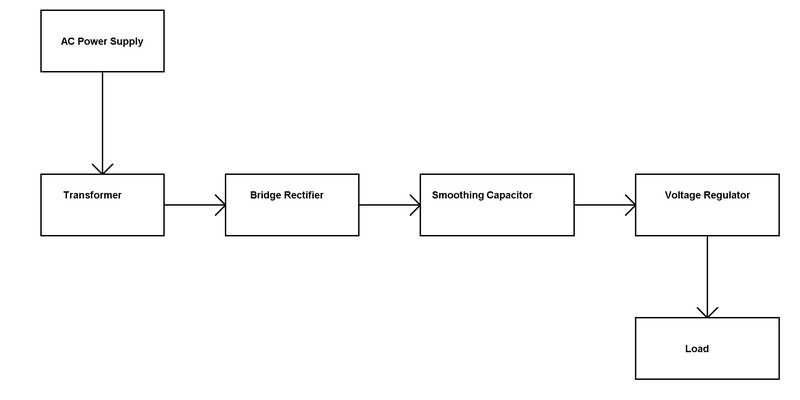 The bridge rectifier gives a continuous pulsating DC signal. Then capacitors are used to filter the pulsating signal into a smooth non-pulsating DC. Finally, the voltage is regulated using a regulator IC. The voltage from the step-down transformer is then fed to the bridge rectifier which generates a continuous pulsating DC signal. 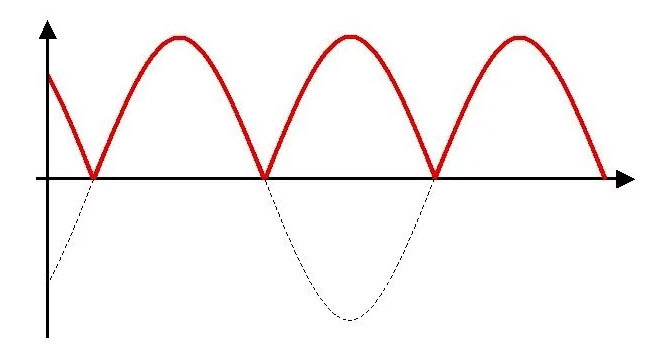 The polarity of the output cannot be inverted and has large ripples in it. This pulsating DC also has some unwanted current (ripples) which makes it impossible for using in powering applications. 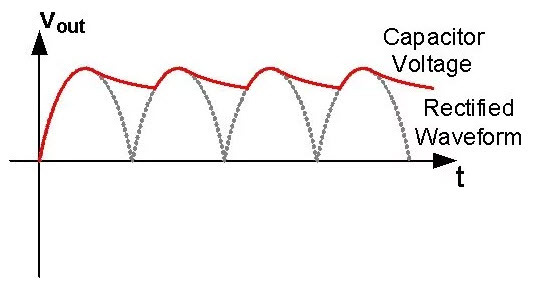 A smoothing capacitor which acts as a filter is used to remove unwanted current (Ripples). Now the output with capacitance will be as shown below figure and further filtered to get pure DC. The smooth, non-pulsating DC signal is fed to the voltage regulator. LM317 is used as a voltage regulator. The capacitors C2 and C4 are used to eliminate the ripples if the filtering process is done away from the regulator. Capacitor C4 also prevents the LM317 voltage regulator to act as an oscillator. The capacitor C3 bypasses the ADJUST pin of a voltage regulator to ground to improve the ripple rejection capability. Diodes are used to protect the regulator from excess flowing through if any voltage source is connected across the output terminals of the regulator. A variable resistance is connected across the ADJ pin of the regulator. The voltage regulator is an integrated circuit which supplies a constant, controlled output voltage irrespective of the change in input voltage. LM317 is a variable voltage regulator with 3 pins monolithic integrated circuit shown below. It is capable of providing 1.5 amps with voltage ranging from 1.25 volts to 30 volts. The ratio of two resistances connected to the LM317 voltage regulator can be used to set the desired voltage level. A variable power supply circuit is built with variable positive voltage regulator LM317, CMOS decade counter IC CD4017, timer IC NE555 and fixed negative voltage regulator LM7912. The AC supply is fed to the transformer which is stepped down to 12V AC. The output of the transformer is rectified using a full wave rectifier to bypass the unwanted spikes and provide smooth, fluctuation free power. Capacitors are used to filter ripples. Both positive and negative half cycles are used to obtain positive and negative DC output. An LED is used for ON indication. Timer IC NE555 is wired as an astable multivibrator to generate clock pulses The output of timer IC is connected to counter IC CD4017. IC CD4017 is a decade ring counter. Each of its outputs goes high one after the other when a clock pulse is received. The outputs of IC CD4017 are connected to the base of the transistor T1 to T10. LED3 to LED11 is used here to indicate the voltage levels. Adjustable voltage regulator IC LM317 develops 1.25V reference voltage. Presets VR1 to VR9 is adjusted to get desired output voltage. When switch S2 has pressed the output of the IC1 goes HIGH and further the outputs of IC2 goes HIGH one after the other as a ring counter. As the presets VR1 to VR9 are connected at the collectors of transistors T2 to T10, different output resistances appear between the adjustable terminal and the ground terminal of IC4 which causes different output voltages. IC LM7912 provides a fixed negative DC voltage of 12V. Thus the power supply unit can be used for circuits requiring both negative and positive voltages. LED2 is used to indicate negative 12V DC voltage. When CD4017 is reset by pressing switch S3 the output voltage changes tom 1.2V and thus the voltage indication LEDs turn OFF. The voltage regulator is an integrated circuit which supplies a constant, controlled output voltage irrespective of the change in input voltage. LM7912 is commonly used 3 terminal negative voltage regulator in electronic circuits. This IC provides constant negative output voltage despite changes in the input voltage. The number 79 indicates that the IC is a negative voltage regulator and 12 indicates the output voltage. The universal power supply is most commonly used the circuit in electronic laboratories. It provides a varied and fluctuation free output. The above universal power supply circuit provides a variable voltage between 3 to 30V, the maximum current of 1.5A and addition of modules can provide a higher current. The adjustable voltage regulator LM317 (U1) offers short circuit. The universal power supply must operate from AC line voltage ranging from 90 to 264V, 50Hz or 60Hz. The rectified input voltage from diode bridge filter capacitor charges up to 120V. This circuit is paired with a high power audio amplifier of 1500W. The circuit is designed for laptop charger with 20V output and it uses TOP 246Y by power integration. TOP 246Y eliminates half the discrete components compared with UC3842. A digital multimeter is a device used to measure the electrical values like voltage, current and resistance. Digital multimeter has replaced analog meters due its high accuracy, reliability and increased impedance. This is all about Variable Power Supply circuit. We hope that you have gone a better understanding of the concept of this topic. Furthermore, any queries regarding this topic or electronics projects, please give your feedback by commenting in the comment section below. 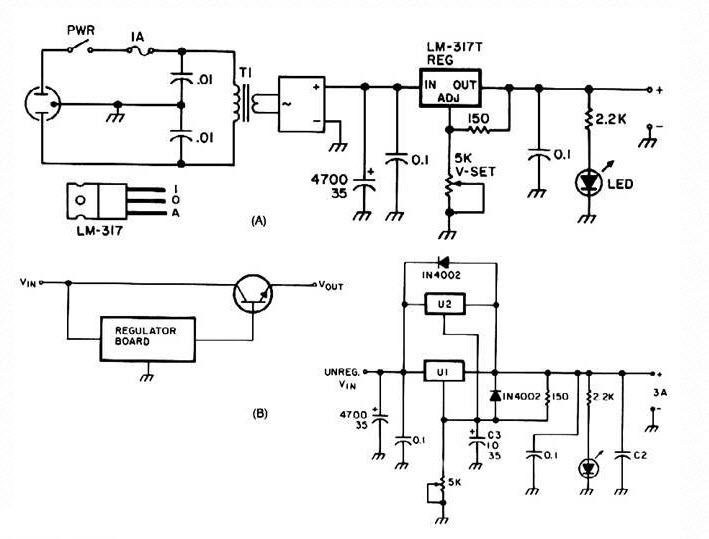 Here is a question for you, what are the applications of LM317? what are the components or ICs to increase the output current of this type or other types of power supplies.